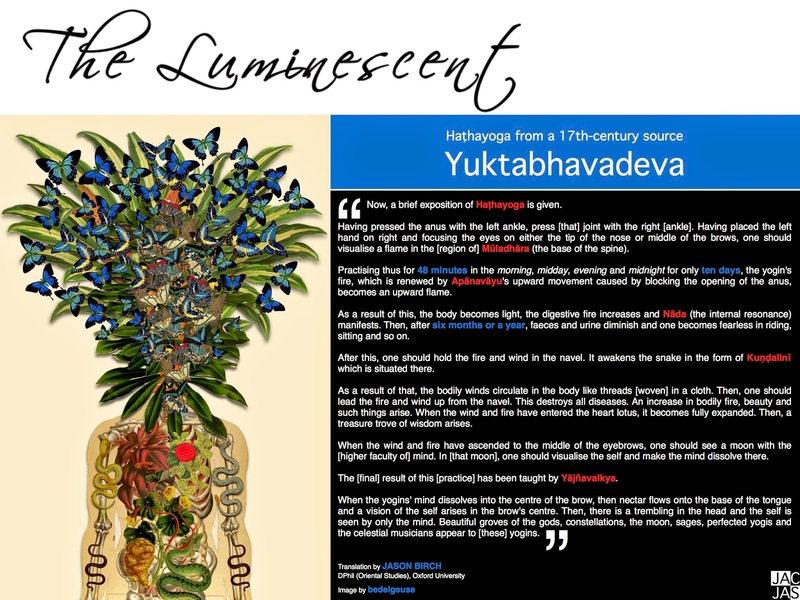 Throughout the history of yoga, the names of āsana have not been consistent. Depending on the linage, the region and the century, the name and form of an āsana varies. 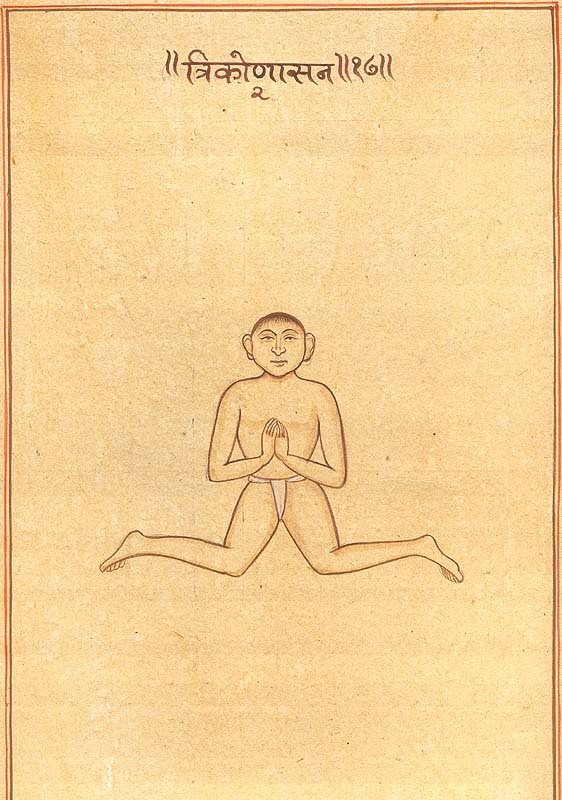 For example, the posture shown here is labelled Trikoṇāsana (Triangle Pose) on this undated folio. Quite different to the Trikoṇāsana practised by modern linages extending from Krishnamacharya. The paper and style of the drawing suggests that it is fairly modern, possibly as late as early 20th century. However, the dating of such material is very difficult without more evidence and a good look at the folio itself. 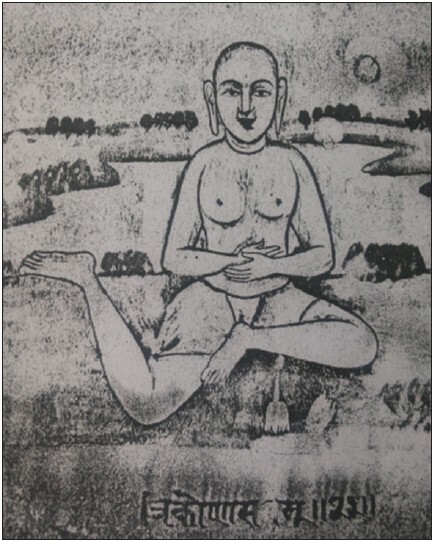 This image belongs to a set of folios from an unknown manuscript that have been separated and sold commercially by an art dealer (which is legal in India for manuscript folios that have artwork on them). 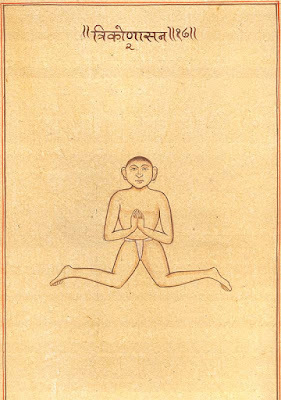 Trikoṇāsana (Triangle Pose) takes another form in a Jain manuscript called 'Yogāsana-Jaina' (likely dated to the 18th - 19th century). This unpublished manuscript has recently been examined by the Philosophico-Literary Research Department of Kaivalyadhama. It contains descriptions of 107 āsanas with illustrations of each and provides an interesting window into the practise of āsanas within the Jaina religion. The Kaivalyadhama research paper can be found here. Vasiṣṭhasaṃhitā (12-13th c.) is one of the earliest Haṭhayoga texts to describe non-seated Āsanas. 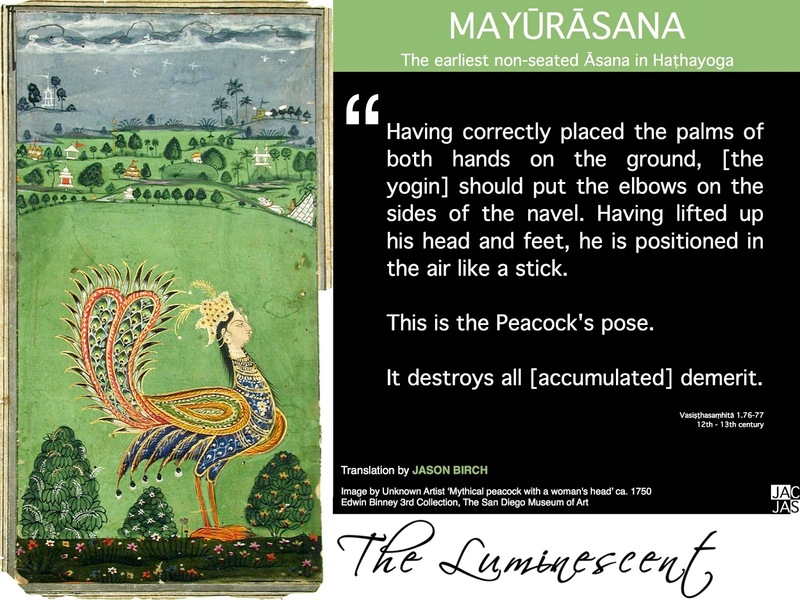 The first is Mayūrāsana, the Peacock Pose, an arm balance with the body positioned on the elbows as described above. Mayūrāsana continues to be mentioned in most late medieval Haṭhayoga texts. The fifteenth-century Haṭhapradīpikā adds that Mayūrāsana turns to ashes all bad and excessive food that has been consumed. It ignites digestive fire (jaṭharāgni) and enables the yogin to digest poison. The latter claim may be based on the fact that peacocks can kill and eat snakes without being poisoned. The second non-seated Āsana in the Vasiṣṭhasaṃhitā is Kukkutāsana, the Rooster Pose, another arm balancing posture in which the hands are threaded through the legs in Padmāsana. Both of these postures are still widely practised in modern postural yoga. Image from a 19th c. manuscript of the Jogapradīpikā held at the British Library. I invite you to practise this Mindful Minute Meditation TWICE. Firstly, with the eyes OPENED. Then again, with the eyes CLOSED. Sit tall. Listen carefully. Maintain a sense of wonder and curiosity throughout. 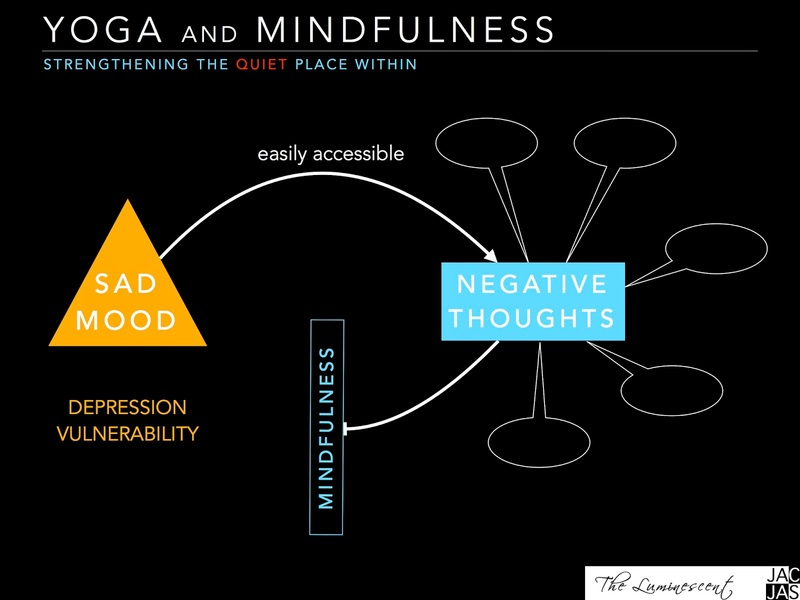 Connecting with the body and the sensations experienced is an essential part of Mindfulness practice. This means actively choosing to be RECEPTIVE to the sights, sounds, smells and tastes of the present moment. An example might be something as simple as listening to the sound of water as you wash your hands or feeling the touch of a banister as you walk upstairs. SOUND can be an effective object of focus in meditation. It offers an alternative to a visual or felt object (such as the breath). It can be particularly helpful for those who suffer anxiety, fear, worry or panic attacks. At the University of Bergen in Norway, Vollestad, Nielsen, and Nielsen surveyed 19 studies of the effectiveness of Mindfulness Based Therapy (MBT) on anxiety. They found that MBTs are associated with robust and substantial reductions of anxiety symptoms. Read more about the results of this research here. Add a FOCAL point: eyes F O C U S E D but R E L A X E D.
Maintain a sense of W O N D E R and C U R I O S I T Y. Find E A S E as you notice the breath. A conscious minute of C L A R I T Y and S T E A D I N E S S.
Find a sense of E A S E as you notice the breath. The Yuktabhavadeva, which means "The god who is engaged in the world", is a 17th-century compilation on yoga written by Bhavadevamiśra, a Maithila Brahman. This text is a fine example of how Haṭha and Rājayoga were absorbed into mainstream Brahmanical thought. It contains a passage with a concise description of Haṭhayoga as a simple seated practice repeated four times a day for 48 minutes for 6 months (or longer). Colourful visual metaphors describe the states achieved by consistent practice of this technique. Bhavadevamiśra work brings together teachings of Haṭha and Rājayoga with the Pātañjalayogaśāstra and traditional Brahmanical texts such as the Mahābhārata, Purāṇas, Dharmaśāstras, Upaniṣads and so on. Bhavadevamiśra was also fond of the Yogavāsiṣṭha and quotes it extensively in this text. Download this concise description as a PDF. A conscious moment of C L A R I T Y and S T E A D I N E S S.